Sharing Starman’s current position in a diagram to Twitter, SpaceX also tweeted a nod to Douglas Adams’ seminal work The Hitchhiker’s Guide to the Galaxy, which is beloved by Musk. (The Restaurant at the End of the Universe refers to the second book in the series.) The dash of the Roadster itself even has a nod to Hitchhiker’s Guide, as Space.com notes the words “Don’t Panic” on its control panel also appeared on a cover of the novel. SpaceX launched the Tesla Roadster and its inanimate passenger into space as the payload on the Falcon Heavy rocket’s maiden launch in February, a feat that was largely perceived to be a publicity stunt by Musk. Musk’s former ride isn’t the only thing he plans to shoot into space for seemingly little purpose beyond novelty. 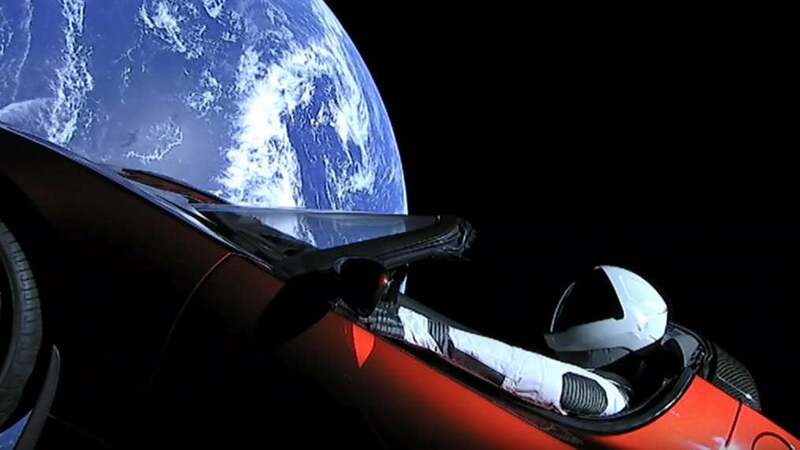 The Roadster and Starman will come within a few hundred thousand kilometers of our planet in 2091, according to an orbit-modeling study. The authors of that study determined that the car will slam into either Venus or Earth, likely within the next few tens of millions of years. They give the space car a 6 percent chance of hitting Earth in the next 1 million years and a 2.5 percent chance of smacking Venus in that span. Being that there’s essentially no way you could ever drive this thing again anyway, that’s probably just fine.